Tax season is officially here: Virginia employers must update their mandatory workplace posters to inform employees that they may qualify for the federal Earned Income Tax Credit (EITC) for the 2018 tax year. The EITC is a refundable federal tax credit that primarily benefits low- and middle-income working families, although some low-income individuals without children may also qualify. Virginia is one of 29 states which have also implemented a supplemental state version of the EITC, known as the Virginia Credit for Low-Income Individuals (CLI). EITC and CLI are both designed to incentivize work by phasing out slowly, as compared to other benefits which may be cut off entirely as soon as an individual reaches a certain income level. 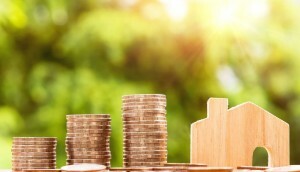 Although these tax credits can have a huge impact on the finances of working families, sometimes raising them out of poverty, research by the Internal Revenue Service (IRS) and the Government Accountability Office indicates that between 15 and 25 percent of households entitled to the federal EITC do not claim their credits. In order to raise awareness among low-income workers, some states require employers to inform employees of their potential eligibility for federal and/or state tax credits. Why was the Virginia EITC notice updated? Since 2009, every employer operating in Virginia is required by state law to post any notice provided by the Virginia Department of Social Services (DSS) that informs employees of their potential eligibility for federal and state earned income tax credits. DSS customarily provides a CLI notice created by the state agency, and a Internal Revenue Service (IRS) publication which describes the federal EITC. 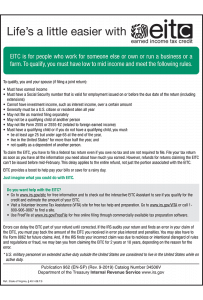 Virginia DSS currently requires employers to post IRS Publication 962 (“Life’s a Little Easier with EITC”), which provides detailed information about the federal Earned Income Tax Credit, including the rules to qualify, the income levels at which a person may qualify, common errors to avoid, and how to get help with the EITC. The notice also now provides a website URL where individuals can find a Volunteer Income Tax Assistance (VITA) site for help with their tax returns. The revision date on the notice has been changed to 11-2018, although the revised notice was not made available until February of 2019. There are no changes to the Virginia CLI notice. GET THE 2019 VIRGINIA EITC NOTICE NOW! If you already own one of Compliance Poster Company’s signature products, you can update your mandatory Virginia workplace poster with the 2019 Virginia EITC Notice Peel ‘N Post™ sticker for only $9.95. The cost-effective alternative to poster subscription services, Peel ‘N Post update stickers are quick and easy to use – simply peel off the backing and post the sticker over the outdated notice on your All-On-One Poster or Mobile Poster Pak. 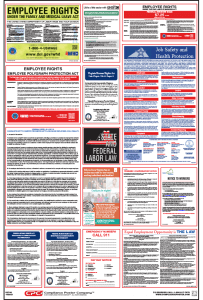 If you’re looking for a complete compliance solution, order a fully up-to-date 2019 Virginia All-On-One™ Labor Law Poster, consolidating all state and federal required postings onto one convenient and attractive wall poster, or a Virginia Mobile Poster Pak™ booklet for mobile and off-site workers or your HR reference desk. Virginia products are available in English and Spanish.